In June, Farm&City took a five day field trip throughout South Texas to spread the good words of two of our major initiatives: Vision Zero Texas and One Thousand Texans for Transit. We were forced to rent a car for this trip as driving was the only mode of transportation that made it possible for us to meet all of our obligations. With this car, we drove 1,000 miles. Early in the morning of Friday, June 16, we packed into the rental car and drove to San Antonio. On Saturday, we were to host the second event in our statewide series of advocacy trainings for One Thousand Texans for Transit. However, we also aim to bring Vision Zero Action Plans to the over 5,000 local governments and agencies throughout the state through our Vision Zero Texas work. 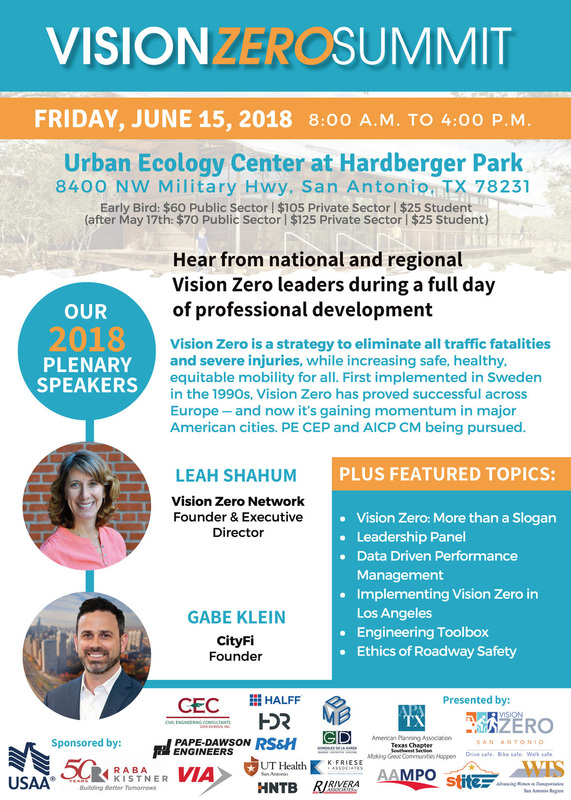 And coincidentally, the forward-thinking Alamo Area Metropolitan Planning Organization (AAMPO) and the City of San Antonio were hosting a Vision Zero Summit. At the summit, we heard from elected officials, transportation engineers, and Vision Zero advocates from throughout the US. The City of San Antonio adopted its Vision Zero Action Plan in 2015 and since then has made headway in leading Texas cities towards a truly safe transportation system. Identifying and tracking targeted sources of data is a critical step in reducing transportation deaths. San Antonio’s Transportation and Capital Improvements department drafted its first Severe Pedestrian Injury Areas Report and found that 33% of crashes occur at just 1% of intersections. We also learned of innovative changes to street design and signaling, including successful implementation of Pedestrian Leading Intervals that have improved not just pedestrian safety, but also vehicle throughput. The City of San Antonio is doing a lot of exciting work with its Vision Zero program, but it needs the help of all related partners – from AAMPO, to TXDOT, to the rest of the governments and transportation authorities throughout the state of Texas. On Saturday morning, we hosted an advocacy training for One Thousand Texans for Transit (video). Representatives from San Antonio’s transit agency, VIA, and AAMPO also gave presentations. John Tiemann showcased VIA’s exciting regional Bus Rapid Transit Network plan and discussed their extensive community engagement (pptx). Linda Alvarado-Vela, Planning/Public Involvement Program Manager at AAMPO, gave an introduction to the structure and function of metropolitan planning organizations and highlighted the interdependence of sustainable land use and transportation policy (pptx). At Farm&City, we know the various negative consequences of sprawl, but we were surprised to learn that the San Antonio region has sprawled so far across the region that United States military test operations and trainings have been disrupted and conflict with residents (neighbors). Just as San Antonio is leading on Vision Zero, VIA is focused on providing high quality public transit and enticing more riders. Among the major Texas metros, VIA serves the most number of trips per regional resident, is funded the least per regional resident, and also charges the lowest fares, approximately half of DART fares across services. We explored downtown Corpus Christi, finding both heartwarming urbanist design and some room for improvement. Importantly, it only took us ten minutes of meandering to find safe street design retrofits, including bulbouts at intersections, and a bike share station! And throughout the city, we saw bike lanes of generous width, though they were unprotected by any barrier from motor vehicle traffic. Additionally, much of downtown was covered in new sidewalks which provided robust wheelchair accessibility, especially at intersections, where the precise location of curb cut ramps is critical to a straightforward transportation experience for people with mobility impairments. We did find room for improvement. There was a healthy supply of restaurants and bars downtown and many appeared to have massive and unpriced parking lots despite the incentive to drink and drive that underpriced and excessive parking provides. Cities should not require parking and given the overabundance of parking in America and the related concerns such as the heat island effect, inhibited walkability, auto-dependancy, and drunk driving, cities would do well to institute parking maximums. In any case, the Corpus Christi Unified Development Code does in fact have arbitrary parking requirements, including one spot per every 150 square feet of gross floor area for restaurants. Considering that each parking space requires over 200 square feet of pavement, restaurants are required to dedicate more land to parking than the restaurant itself. However, the oysters were excellent. We also had the pleasure of riding a bus on the CCRTA system to and from a lively mall 10 miles away from our hotel. Fares were very reasonable, at 75 cents for a single trip and $1.75 for a day pass. After great deliberation, it was decided that these 20 sustainable miles traveled would count towards our tally of 1,000. It was a great day exploring Corpus Christi! At 9am Monday morning, we met with representatives from Corpus Christi staff from transportation planning, engineering, and public safety. The key to a successful Vision Zero Action Plan is for all existing stakeholder government departments to coordinate efforts that could lead to reducing deaths. It was promising that these different departments were interested in learning more about Vision Zero. We engaged in a thoughtful discussion on what a Vision Zero Action Plan for Corpus Christi would look like. Corpus Christi has numerous proactive transportation safety programs in place across different departments, but annual traffic fatalities have fluctuated from 20 to 40 deaths per year in a city of 325,000. From Corpus, we immediately drove to Laredo, where we were invited by Laredo City Councilmember George Altgelt to present the case for Vision Zero to both the Laredo Metropolitan Planning Organization and to Laredo City Council. In Laredo, we were joined by Stephen Ratke, Safety Engineer with the Federal Highway Administration. Most attending members of the Laredo MPO were interested in Vision Zero, though one county commissioner brought up concerns with the cost of implementing Vision Zero. This was an opportunity to make an important point about Vision Zero—Vision Zero is not a program to pour money into, it is a new understanding of transportation planning. Cities, counties, and MPOs already spend a significant amount of their resources on transportation, be it directly through roadbuilding, or indirectly through providing emergency services following crashes. TXDOT alone spends $10 billion a year; a statewide Vision Zero plan would prioritize saving lives with this funding. We also brought Vision Zero to the attention of Laredo City Council. At both the MPO and the City Council, incremental steps were taken to address concerns and to clarify what Vision Zero for these entities could mean. Finally, we left from Laredo to go to Houston and then back to Austin. It was my first time going through a border checkpoint. It went fine, I said yes when asked if I was a citizen. Though thousands of Texans are trapped by border checkpoints and have to think about them more than I do. It was raining heavily and we got lost, adding just enough miles to our trip to help us reach 1,000. In Houston, we were invited to a meeting of the Houston Coalition for Complete Streets. The City of Houston is the largest city in the nation that does not have a Vision Zero Action Plan, but does have promising transportation safety initiatives underway, such as the Complete Streets Executive Order, a Safe Passing Ordinance, the Complete Communities initiative, a newly proposed Safer Streets program, and systemic changes to planning and transportation from the Houston Walkable Places Committee. Finally, we headed back out onto Texas highways to head home to Austin, getting our rental car back 108 hours after leaving Austin on Friday.